We are excited to announce that due to the success of the first ghost hunt at our exclusive location The Kursaal, we are back there in June! This beautiful & atmospheric building has been well loved for many years & we can’t wait to see what happens when the lights go out! There have been many stories over the years of hauntings in the Kursaal including aparitions, voices & steps. A lady has been seen in the past where the bowling alley is now. When we investigated the building back in February, we had some fantastic activity is several areas of the building so we can’t wait to see what happens when we return. 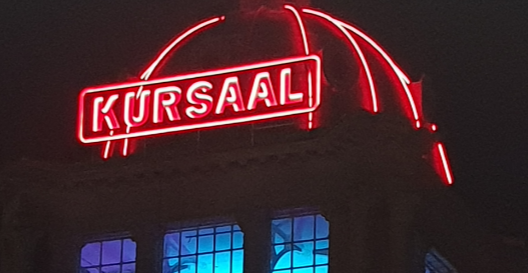 The Kursaal is a grade II listed building along the seafront of Southend On Sea & has been a popular tourist attraction for many years. During the 1970’s the ballroom was a popular music venue with performances by a number of big bands including Queen, Deep Purple, Thin Lizzy, Black Sabbath & even appeared on the front cover of AC/DC Let There Be Rock album from their performance back in 1977. It was originally opened in 1901 as one of the world’s first purpose built amusement parks, containing a ballroom, arcade, circus, billiard room & dining hall. The Kursaal was created by father & son, Alfred & Bernard Wiltshire Tollhurst after purchasing the 4 acres of land back in 1893. It was opened 1894 as the Marine Park & Gardens. In 1901 the grand entrance pavilion was opened & called the Kursaal & it was designed by Campbell Sherrin. The name is German and means the public building at a spa in which entertainment is provided. It certainly lived up to its name over the years. There were many rides & activities including bumper cars, waltzer, miniature railway, ghost train & wall of death. The Kursaal fell into decline during the 1970’s with the outdoor amusements closing in 1973 before they finally closed their doors in 1986. The main Kursaal building was reopened in 1998 with a bowling alley, casino & amusements. They have now added a soft play & laser gaming centre.